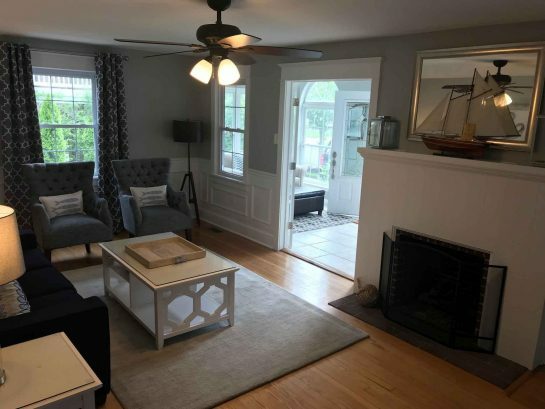 This house has two living rooms. 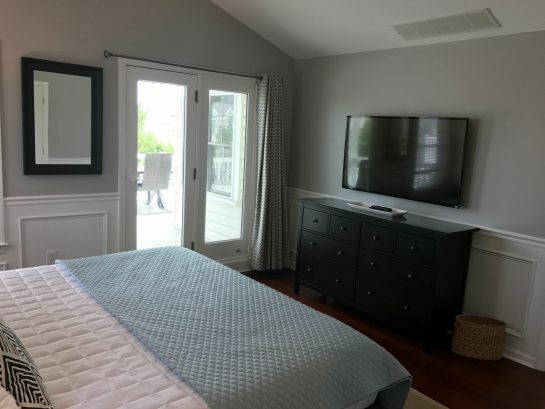 One living room on the 1st floor that can "close up" , (has a door) to be a 6th bedroom. 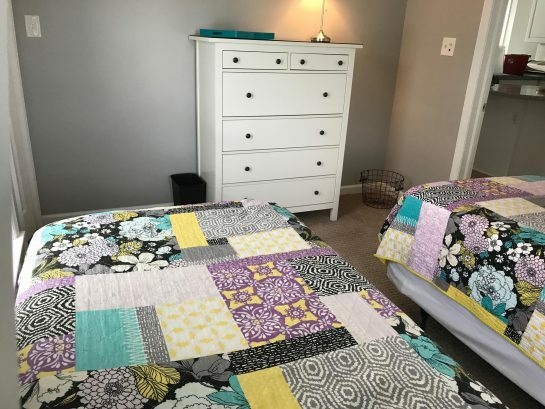 That is why it is listed as a 6 bedroom. 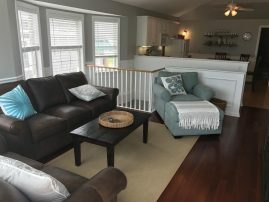 It also has a large second floor living room. This it the main living room. Cathedral ceiling, kitchen and expansive ocean views. etc. 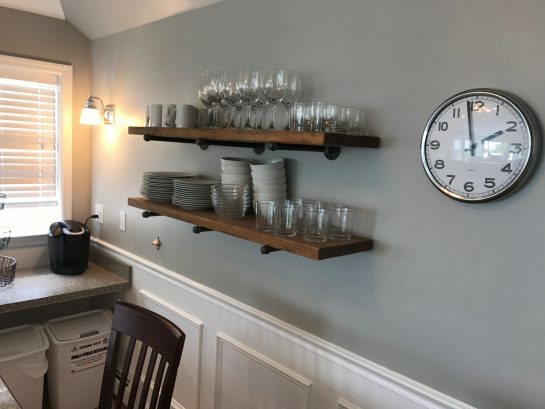 This is where you will spend all of your time. Location, Location, Location. 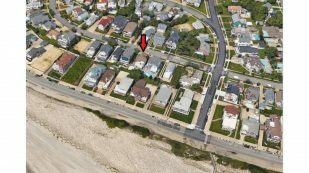 249 Ocean is a single home, on a large lot and is one house from the beach. It includes breath taking views from the very large rear deck, roof top deck and from nearly every 2nd story window inside the house! 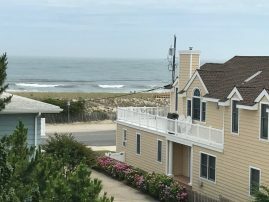 In addition to the incredible location, 249 Ocean Road is the epitome of “sea shore vintage elegance!” This home was built in 1948, expanded and completely renovated in 2001, and then renovated again by the current owners (me) in May and June of 2017. The 5/6 bedroom, large single home went through a two month renovation in the Spring of 2017 that included updated kitchen, new appliances, new two zone HVAC system, new paint, all new carpeting, new doors, TV’s, – and ALL new furniture. No expense was spared in this 2017 makeover. 249 Ocean has all the creature comforts of a newly constructed Single Gardens home, with some elegant touches of the past. 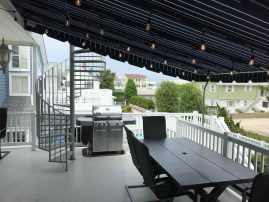 249 Ocean includes box mouldings, hard wood floors, central air conditioning, large back yard with a propane fire pit, long driveway that can fit 4 cars, two car detached garage; an expansive rear deck and roof top deck with incredible ocean views. 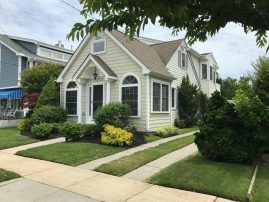 All in the bucolic, single home setting of the Gardens section of Ocean City! 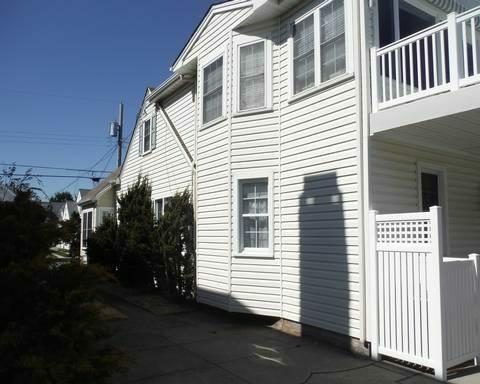 249 Ocean is only 3 blocks north of the world famous Ocean City Boardwalk. 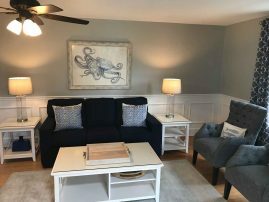 Enjoy everything that Ocean City has to offer at 249 Ocean. 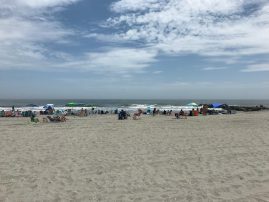 The Summer Peak Week Rate (June 15 to Labor Day) is $7,500. Off-Peak weeks please see rate schedule. As you enter the Ocean Road section of the Gardens neighborhood, you will instantly notice, fewer homes, larger lots, wider streets, larger homes complete with backyards, long driveways, detached garages, lush professionally landscaped front lawns – and 249 Ocean Road is no exception. 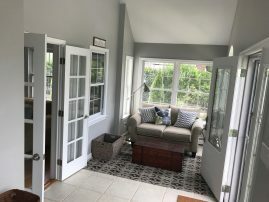 As you enter the front door, you step into a beautiful sun room. The sun room is fully enclosed, include tons of windows and a 2 story vaulted ceiling. 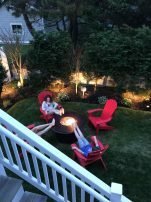 Grab your favorite book, sit on the overstuffed love seat and escape. 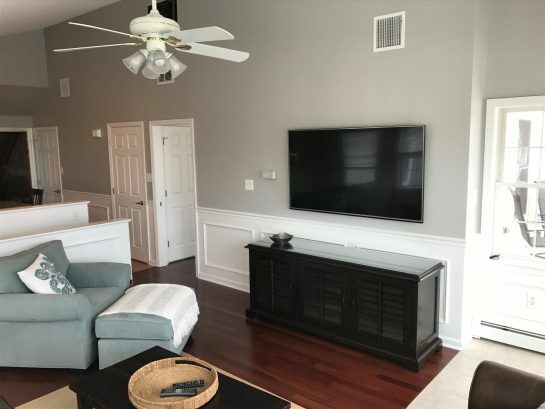 Stepping, further into the house, you will find a very large living room (1 of 2 living rooms in the house) that can be a 6th bedroom. 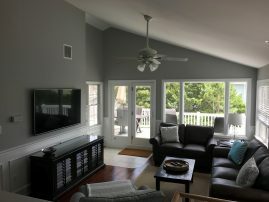 The first floor living room includes a large sofa (with sofa bed) and love seat set, overstuffed leather reclining chair, teak coffee table, fireplace and a 60” Flat panel HDTV. In the middle of the first floor is the dining room, complete with a table for 6. In the rear of the first floor there are three (3) large bedrooms -a 6th bedroom if you close up the living room. 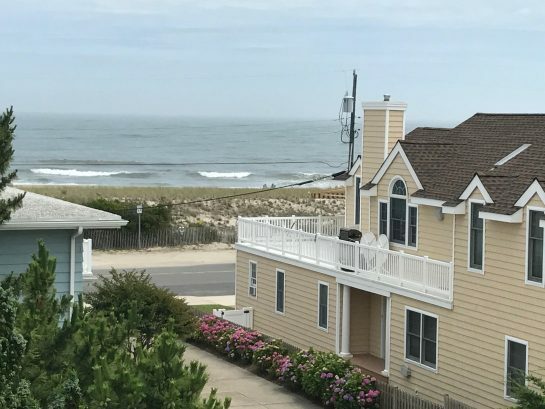 These are not your typical, “cozy” Ocean City bedrooms. They are large. The first, 1st floor bedroom has a queen bed, closet and Flat Panel HDTV. 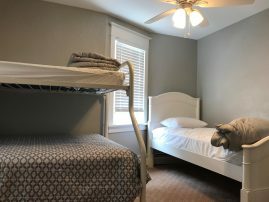 The second, 1st floor bedroom is the bunkbed room. This room has a full over twin bunk bed and a twin bed. 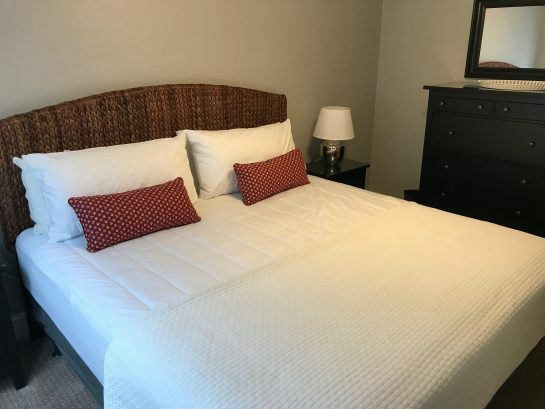 The third 1st floor bedroom has a king sized bed, Flat Panel HDTV, and large bureau. The 1st floor ends with a full bath and large laundry and mudroom. 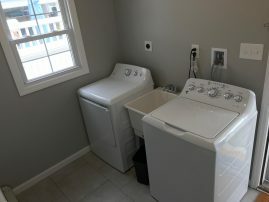 The laundry room has a full sized washer and dryer. Walk up the interior staircase and you will find the 2nd floor, a two-story vaulted modern space! 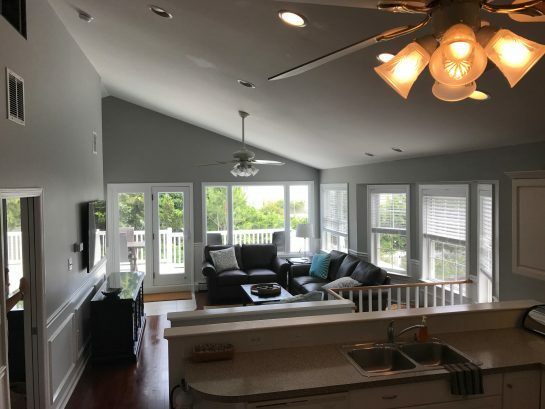 Open concept is the key to the second floor of this upside down single home and the ocean views really make the experience. 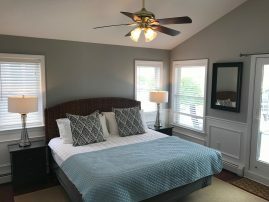 The 2nd floor includes the master bedroom and master bath, a modern kitchen, the second of two living rooms, the 4th and 5th bedrooms and access to the massive rear deck and rooftop deck. Every east facing window has ocean views, including oceans views from the kitchen, living room and master bedroom. 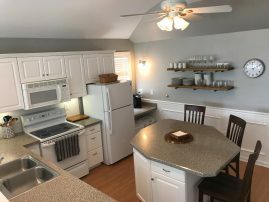 The Kitchen is equipped with an electric range and oven, full size refrigerator, kitchen island with seating for 3, a microwave and dishwasher. 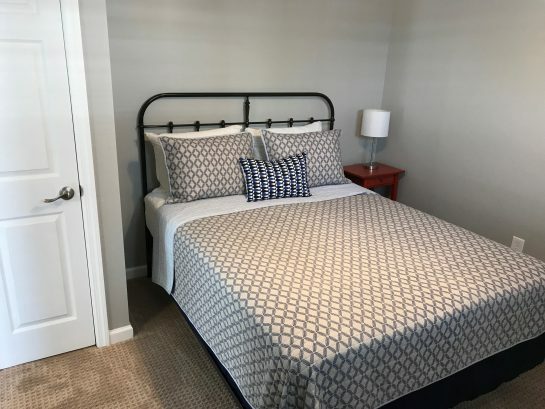 The master bedroom has a king sized bed, private access to the rear deck, walk in closet, and a master bath. 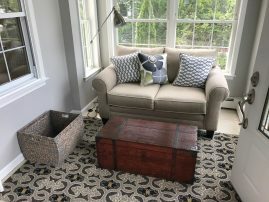 The living room is beautifully furnished with a leather love seat, leather sofa and an overstuffed chair and a half with ottoman. 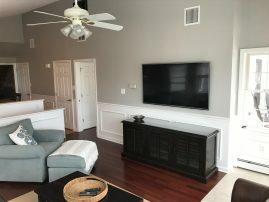 It also includes a teak coffee table, credenza and a 65” Flat Panel HDTV. 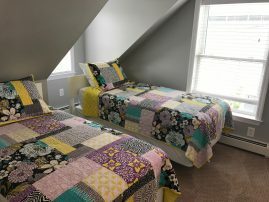 The 2nd floor also includes the 5th Bedroom. The 5th bedroom includes two twins beds, and large bureau. Step onto the expansive ocean facing rear deck from either the master bedroom or living room. This rear deck does not disappoint. It is the full width of the house and extends ~15 feet towards the ocean. Sit outside and experience the ocean with all of your senses – site, sound and smell. You can see, hear and taste the ocean from this deck! The deck is fully furnished with an outdoor farm table that seats 10. It also has 6 comfortable chairs for ocean viewing. 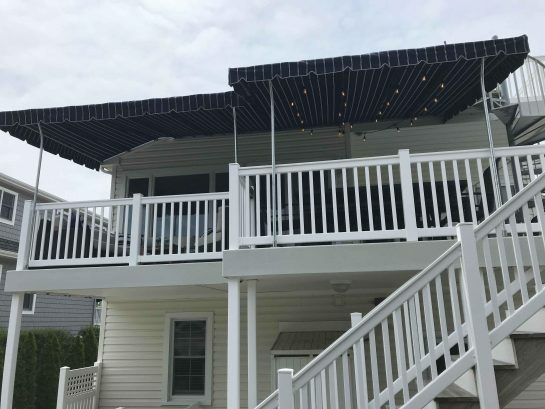 Turn on the electric, retractable awning. Sit under the shade of the awning and listen to the waves and watch the boats go by. 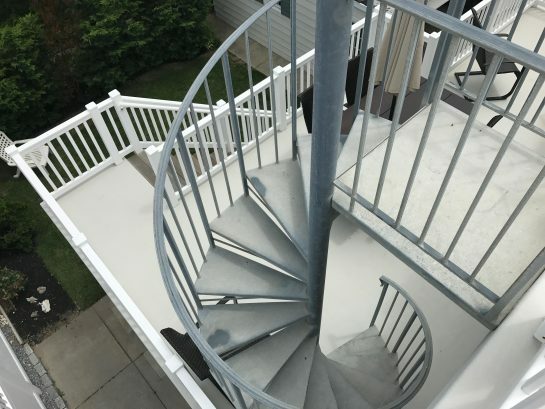 On the far end of the deck, you will find a spiral stair case to the roof top deck. The roof top deck has two chairs for enjoyment of excellent views from every direction. Get away and see the best views in all of Ocean City. Look north and you will see all the best that Atlantic City Casinos has to offer – the casinos put on a “light show” at night. Excellent spot for Firework viewing! 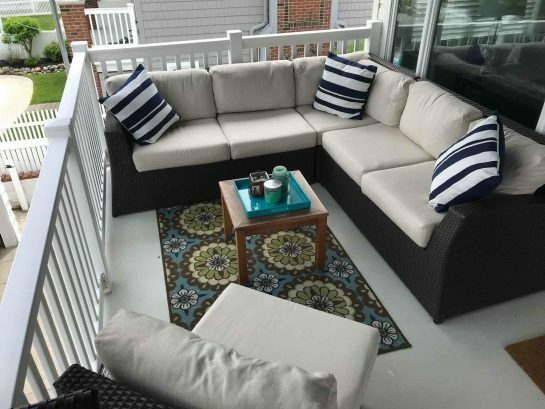 The 2nd Floor rear deck also has an exterior stair case down to the back yard – yes, that’s correct - a backyard. Tired of the beach, lounge on the back lawn. 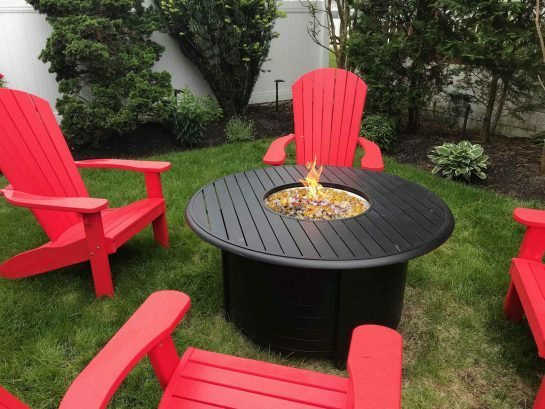 The back yard is equipped with a fire pit. At night, turn on the easy-to-use propane fire pit and enjoy the evening summer air. 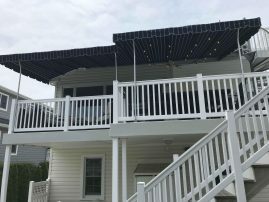 The back yard also includes a large two car detached garage, a fully enclosed outdoor shower, with dressing room and a stainless steel propane grill. It also includes a covered patio on the rear first floor and a very long driveway for at least 5 cars. Peak weeks (June 16 to Sept 1) are $6,900. Off-Peak rates, please call. We do NOT rent to minors (under 25), senior week renters and our home does NOT allow pets. No Exceptions. 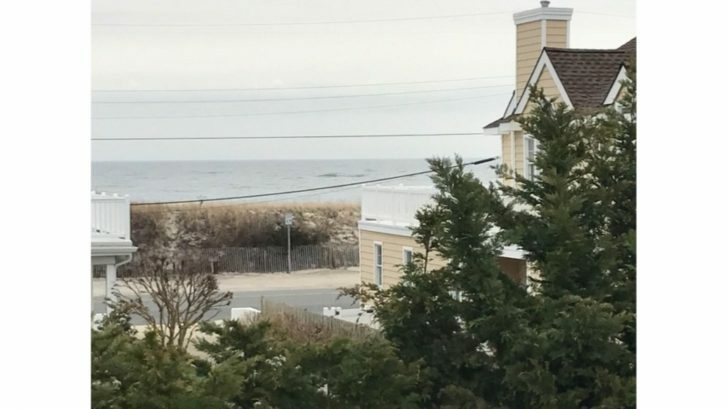 2nd Floor Ocean Views From both rear decks and inside the house!!! 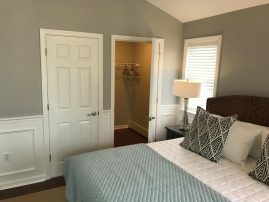 1st Floor Laundry Room - Full Size Washer & Dryer and Mud room! 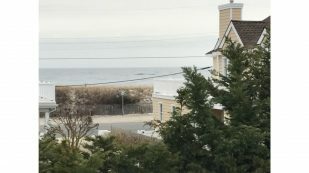 One House from Surf Road Beach - The beach is guarded! There have been 7362 visitors to this page since the listing was published on the site. This listing was first published here on 07/29/2017.